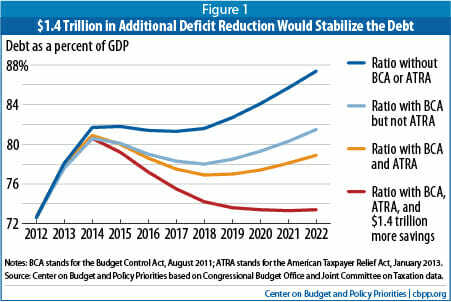 Kevin Drum dredges up this chart from somewhere to supposedly demonstrate that only a little bit of spending cuts are needed to achieve fiscal stability. Likely the numbers in this chart are a total crock - spending cuts over 10 years are never as large as the government forecasts and tax increases, particularly on the rich, seldom yield as much revenue as expected. But leave those concerns aside. What about the Fed? The debt as a percent of GDP shown for 2012 in this chart is around 72%. Though it is not labelled as such, this means that this chart is showing public, rather than total, government debt. The difference is the amount of debt held by federal agencies. Of late, this amount has been increasing rapidly as the Fed buys Federal debt with printed money. Currently the total debt as a percent of GDP is something like 101%. The Left likes to use the public debt number, both because it is lower and because it has been rising more slowly than total debt (due to the unprecedented growth of the Fed's balance sheet the last several years). But if one insists on making 10-year forecasts of public debt rather than total debt, then one must also forecast Fed actions as part of the mix. Specifically, the Fed almost certainly will have to start selling some of the debt on its books to the public when the economy starts to recover. That, at least, is the theory as I understand it: when interest rates can't be lowered further, the Fed can apply further stimulus via quantitative easing, the expansion of the money supply achieved by buying US debt with printed money. But the flip side of that theory is that when the economy starts to heat up, that debt has to be sold again, sopping up the excess money supply to avoid inflation. In effect, this will increase the public debt relative to the total debt. It is pretty clear that the authors of this chart have not assumed any selling of debt from the Fed balance sheet. The Fed holds about $2 trillion in assets more than it held before the financial crisis, so that selling these into a recovery would increase the public debt as a percent of GDP by 12 points. In fact, I don't know how they get the red line dropping like it does unless they assume the current QE goes on forever, ie that the FED continues to sop up a half trillion dollars or so of debt every year and takes it out of public hands. This is incredibly unrealistic. While a recovery will likely be the one thing that tends to slow the rise of total debt, it may well force the Fed to dump a lot of its balance sheet (and certainly end QE), leading to a rise in public debt. Here is my prediction: This is the last year that the Left will insist that public debt is the right number to look at (as opposed to total debt). With a reversal in QE, as well as the reversal in Social Security cash flow, public debt will soon be rising faster than total debt, and the Left will begin to assure us that total debt rather than public debt is the right number to look at. Warren, I believe you have made an erroneous assumption in your argument. "Debt Held by the Public" is currently about $11.7 trillion, or roughly 72% of GDP (as you note), while "Total Public Debt Outstanding" is about $16.4 trillion, all according to treasurydirect.gov. The former excludes "Intragovernmental Holdings" of $4.9 trillion. You incorrectly assume that the intergovernmental category includes Treasury debt that has been purchased by the Fed, but it does not. The "Intragovernmental Holdings" amount is not held by the Federal Reserve... it's mainly a bookkeeping entry for the "Social Security Trust Fund" along with a couple of other minor items. Anything the Federal Reserve holds as assets on its balance sheet (around $2.7 trillion in treasuries) is part of the "Debt Held by the Public". The Debt Held by the Public is all federal debt held by individuals, corporations, state or local governments, foreign governments, and other entities outside the United States Government less Federal Financing Bank securities. Types of securities held by the public include, but are not limited to, Treasury Bills, Notes, Bonds, TIPS, United States Savings Bonds, and State and Local Government Series securities. When the Fed starts to reduce its balance sheet and at some point it will, will they not be selling mortgage backed securities and treasuries into a rising interest rate environment? A money losing proposition, no? Are they capitalized sufficiently to remain solvent? The above chart only works because the nominal rate on TBills is almost zero. Should the rate rise to 3-4% the analysis falls apart and the government will spend more of current revenues as a consequence. [edited] If one adds the unfunded liabilities of Social Security and Medicare to our official national debt, we really owe $72 trillion, by the Obama administration’s projections for future Medicare savings under Obamacare, and as much as $137 trillion under more realistic projections. Under the best-case scenario, this is more than 480% of GDP (4.8 x), and 911% of GDP (9.1 x) more realistically. Promises that can't be paid won't be paid. Inter-agency debt represents cash collected by that agency at some time in the past, withdrawn into the general Treasury, and spent. Government bookkeeping leaves a note in the form of special bonds which the Treasury promises to pay back in the future. All such payback would require funds from taxes or borrowing from the public. For example, the Social Security Trust Fund is inter-agency debt. The special, non-marketable, Treausury bonds in that fund represent the SSec taxes collected over time above required distributions. These days, about $50 billion more is being paid out than received in SSec taxes. That is, $50 billion in trust fund bonds are being presented to the Treasury for repayment each year. The Treasury repays with cash derived from current taxes and borrowings. The SSec trust fund is about 2.7 trillion in these special bonds (political promises). But, this fund is not directly related to the liabilities (promises) of SSec in the future. Social Security's unfunded liability in perpetuity is $17.5 trillion (the trust fund is meaningless [See the article -AMG]). Social Security would need that much money today, [real resources] in a real fund outside the government, earning a true return [3%] to pay for all the benefits that have been promised over and above future Social Security taxes. We don't have that fund. Alternatively, the payroll tax rate would have to rise by 4% [4 percentage points, from 15.3% to 19.3% of payroll]. Intergovernmental debt is basically the revenues collected from earmarked taxes - like Social Security but also things like the gas tax, airport fees, military pension funds, etc. This money is spent by the govt as soon as it is received RATHER than sell T-bills to the public but when the govt does this it issues Special Issue T-notes to the account it borrowed the money from. So let's say the govt spent the money collected from gas taxes - on something else that it needed to pay bills on right away - let's say on military dependents health care claims. Now as soon as the Highway folks need that money for a new road, the Fed has to pay it back. The highway folks will present their special issue notes to be redeemed for cash. At that point, the Fed would sell more T-notes to the public to give them their cash back. Each of these accounts that account for earmarked taxes (and fees) is called a "Trust Fund". In the Govt - the word Trust Fund does not mean the same thing it does in the private sector. In the govt, a Trust Fund is basically a separate accounting for a dedicated (earmarked) tax or fee. An earmarked/dedicated tax or fee, let's pick the gas tax again - is collected on fuel and by law can be spent on only things laid out in the legislation which is transportation infrastructure. The fact that the govt can "borrow" this money is why it is called intergovernmental debt to differentiate it from T-bills sold directly to the public. Basically when you add up all these different trust fund accounts (there are more than 100), they are collected money, not yet spent so the govt borrows it to spend for things like pension benefits for the military until the money has to actually be spent to pay pensions, then they have to sell more T-notes to pay back that fund so it can pay their bills. The govt has purposely chosen to "use" the money flowing into these accounts to pay bills rather than let it sit in the account unused and not earning interest. Some might say the money should stay in the account or be invested in private market securities but that's not how they chose and from time to time you'll hear talk about "lockbox" which would prevent the govt from spending the money in those accounts. but one of the most important things to keep in mind that these intergovernmental accounts don't "expand" to MORE borrowing. the govt can only borrow what is available in these accounts so in that sense there seems to be a misunderstanding of how that process actually works - in this blog post. The govt will always have these separated dedicated accounts to hold things like gas taxes until they are spent on infrastructure and they will never go away but then they will never increase in size either unless of course, they increase taxes on fuels. do need to not spend in deficit - but the misconceptions about how trust funds and intergovernmental debt actually work do not foster a better understanding at all and often lead to shrill pronouncements about what the govt is doing.... which are simply false. Most of that is incorrect, as usual. It is not “money good” and already collected. That is why Socialist Insecurity is now a direct contributor to (increasing) debt held by the public. I haven't found Kevin Drum believable for some years. Maybe it's me. Maybe it's him.